冯秀珍. 社会主义发展史纲. 北京: 中国法制出版社. 2002年. ISBN 7-80083-996-6. 赵明义. 当代社会主义. 济南: 山东大学出版社. 2001年. ISBN 7-5607-2372-1. 申战. 战后东欧与中国社会主义发展历程比较研究. 北京: 中央文献出版社. 2002年. ISBN 7-5073-1133-3. ^ Nove, Alec. Socialism. New Palgrave Dictionary of Economics, Second Edition (2008). A society may be defined as socialist if the major part of the means of production of goods and services is in some sense socially owned and operated, by state, socialised or cooperative enterprises. The practical issues of socialism comprise the relationships between management and workforce within the enterprise, the interrelationships between production units (plan versus markets), and, if the state owns and operates any part of the economy, who controls it and how. ^ Rosser, Mariana V. and J Barkley Jr. Comparative Economics in a Transforming World Economy. MIT Press. 23 July 2003: 53. ISBN 978-0262182348. Socialism is an economic system characterised by state or collective ownership of the means of production, land, and capital. ^ 5.0 5.1 Busky, Donald F. Democratic Socialism: A Global Survey. Praeger. 20 July 2000: 2. ISBN 978-0275968861. Socialism may be defined as movements for social ownership and control of the economy. It is this idea that is the common element found in the many forms of socialism. ^ Bertrand Badie; Dirk Berg-Schlosser; Leonardo Morlino. International Encyclopedia of Political Science. SAGE Publications, Inc. 2011: 2456. ISBN 978-1412959636. Socialist systems are those regimes based on the economic and political theory of socialism, which advocates public ownership and cooperative management of the means of production and allocation of resources. ^ Zimbalist, Sherman and Brown, Andrew, Howard J. and Stuart. Comparing Economic Systems: A Political-Economic Approach. Harcourt College Pub. October 1988: 7. ISBN 978-0155124035. Pure socialism is defined as a system wherein all of the means of production are owned and run by the government and/or cooperative, nonprofit groups. ^ Brus, Wlodzimierz. The Economics and Politics of Socialism. Routledge. 5 November 2015: 87. ISBN 978-0415866477. This alteration in the relationship between economy and politics is evident in the very definition of a socialist economic system. The basic characteristic of such a system is generally reckoned to be the predominance of the social ownership of the means of production. ^ Michie, Jonathan. Readers Guide to the Social Sciences. Routledge. 1 January 2001: 1516. ISBN 978-1579580919. Just as private ownership defines capitalism, social ownership defines socialism. The essential characteristic of socialism in theory is that it destroys social hierarchies, and therefore leads to a politically and economically egalitarian society. Two closely related consequences follow. First, every individual is entitled to an equal ownership share that earns an aliquot part of the total social dividend…Second, in order to eliminate social hierarchy in the workplace, enterprises are run by those employed, and not by the representatives of private or state capital. Thus, the well-known historical tendency of the divorce between ownership and management is brought to an end. The society – i.e. every individual equally – owns capital and those who work are entitled to manage their own economic affairs. ^ Arnold, Scott. The Philosophy and Economics of Market Socialism: A Critical Study. Oxford University Press. 1994: 7–8. ISBN 978-0195088274. This term is harder to define, since socialists disagree among themselves about what socialism ‘really is.’ It would seem that everyone (socialists and nonsocialists alike) could at least agree that it is not a system in which there is widespread private ownership of the means of production…To be a socialist is not just to believe in certain ends, goals, values, or ideals. 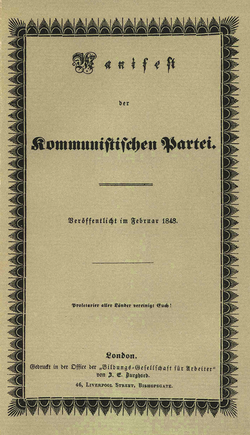 It also requires a belief in a certain institutional means to achieve those ends; whatever that may mean in positive terms, it certainly presupposes, at a minimum, the belief that these ends and values cannot be achieved in an economic system in which there is widespread private ownership of the means of production…Those who favor socialism generally speak of social ownership, social control, or socialization of the means of production as the distinctive positive feature of a socialist economic system. ^ Hastings, Mason and Pyper, Adrian, Alistair and Hugh. The Oxford Companion to Christian Thought. Oxford University Press. 21 December 2000: 677. ISBN 978-0198600244. Socialists have always recognized that there are many possible forms of social ownership of which co-operative ownership is one...Nevertheless, socialism has throughout its history been inseparable from some form of common ownership. By its very nature it involves the abolition of private ownership of capital; bringing the means of production, distribution, and exchange into public ownership and control is central to its philosophy. It is difficult to see how it can survive, in theory or practice, without this central idea. ^ Kolb, Robert. Encyclopedia of Business Ethics and Society, First Edition. SAGE Publications, Inc. 19 October 2007: 1345. ISBN 978-1412916523. There are many forms of socialism, all of which eliminate private ownership of capital and replace it with collective ownership. These many forms, all focused on advancing distributive justice for long-term social welfare, can be divided into two broad types of socialism: nonmarket and market. ^ Bockman, Johanna. Markets in the name of Socialism: The Left-Wing origins of Neoliberalism. Stanford University Press. 2011: 20. ISBN 978-0-8047-7566-3. socialism would function without capitalist economic categories – such as money, prices, interest, profits and rent – and thus would function according to laws other than those described by current economic science. While some socialists recognised the need for money and prices at least during the transition from capitalism to socialism, socialists more commonly believed that the socialist economy would soon administratively mobilise the economy in physical units without the use of prices or money. ^ Steele, David Ramsay. From Marx to Mises: Post Capitalist Society and the Challenge of Economic Calculation. Open Court. September 1999: 175–77. ISBN 978-0875484495. Especially before the 1930s, many socialists and anti-socialists implicitly accepted some form of the following for the incompatibility of state-owned industry and factor markets. A market transaction is an exchange of property titles between two independent transactors. Thus internal market exchanges cease when all of industry is brought into the ownership of a single entity, whether the state or some other organization...the discussion applies equally to any form of social or community ownership, where the owning entity is conceived as a single organization or administration. ^ Is Socialism Dead? A Comment on Market Socialism and Basic Income Capitalism, by Arneson, Richard J. 1992. Ethics, vol. 102, no. 3, pp. 485–511. April 1992: "Marxian socialism is often identified with the call to organize economic activity on a nonmarket basis." ^ Market Socialism: The Debate Among Socialists, by Schweickart, David; Lawler, James; Ticktin, Hillel; Ollman, Bertell. 1998. From "The Difference Between Marxism and Market Socialism" (pp. 61–63): "More fundamentally, a socialist society must be one in which the economy is run on the principle of the direct satisfaction of human needs...Exchange-value, prices and so money are goals in themselves in a capitalist society or in any market. There is no necessary connection between the accumulation of capital or sums of money and human welfare. Under conditions of backwardness, the spur of money and the accumulation of wealth has led to a massive growth in industry and technology ... It seems an odd argument to say that a capitalist will only be efficient in producing use-value of a good quality when trying to make more money than the next capitalist. It would seem easier to rely on the planning of use-values in a rational way, which because there is no duplication, would be produced more cheaply and be of a higher quality." ^ The Economics of Feasible Socialism Revisited, by Nove, Alexander. 1991. p. 13: "Under socialism, by definition, it (private property and factor markets) would be eliminated. There would then be something like ‘scientific management’, ‘the science of socially organized production’, but it would not be economics." ^ Kotz, David M. Socialism and Capitalism: Are They Qualitatively Different Socioeconomic Systems? (PDF). University of Massachusetts. [19 February 2011]. "This understanding of socialism was held not just by revolutionary Marxist socialists but also by evolutionary socialists, Christian socialists, and even anarchists. At that time, there was also wide agreement about the basic institutions of the future socialist system: public ownership instead of private ownership of the means of production, economic planning instead of market forces, production for use instead of for profit." ^ Toward a Socialism for the Future, in the Wake of the Demise of the Socialism of the Past, by Weisskopf, Thomas E. 1992. Review of Radical Political Economics, Vol. 24, No. 3-4, p. 2: "Socialism has historically been committed to the improvement of people's material standards of living. Indeed, in earlier days many socialists saw the promotion of improving material living standards as the primary basis for socialism's claim to superiority over capitalism, for socialism was to overcome the irrationality and inefficiency seen as endemic to a capitalist system of economic organization." ^ Prychito, David L. Markets, Planning, and Democracy: Essays After the Collapse of Communism. Edward Elgar Publishing. 31 July 2002: 12. ISBN 978-1840645194. Socialism is a system based upon de facto public or social ownership of the means of production, the abolition of a hierarchical division of labor in the enterprise, a consciously organized social division of labor. Under socialism, money, competitive pricing, and profit-loss accounting would be destroyed. ^ O'Hara, Phillip. Encyclopedia of Political Economy, Volume 2. Routledge. September 2000: 71. ISBN 978-0415241878. Market socialism is the general designation for a number of models of economic systems. On the one hand, the market mechanism is utilized to distribute economic output, to organize production and to allocate factor inputs. On the other hand, the economic surplus accrues to society at large rather than to a class of private (capitalist) owners, through some form of collective, public or social ownership of capital. ^ Market Socialism: The Debate Among Socialists, by Schweickart, David; Lawler, James; Ticktin, Hillel; Ollman, Bertell. 1998. From "The Difference Between Marxism and Market Socialism" (P.61-63): "More fundamentally, a socialist society must be one in which the economy is run on the principle of the direct satisfaction of human needs...Exchange-value, prices and so money are goals in themselves in a capitalist society or in any market. There is no necessary connection between the accumulation of capital or sums of money and human welfare. Under conditions of backwardness, the spur of money and the accumulation of wealth has led to a massive growth in industry and technology ... It seems an odd argument to say that a capitalist will only be efficient in producing use-value of a good quality when trying to make more money than the next capitalist. It would seem easier to rely on the planning of use-values in a rational way, which because there is no duplication, would be produced more cheaply and be of a higher quality." ^ Bockman, Johanna. Markets in the name of Socialism: The Left-Wing origins of Neoliberalism. Stanford University Press. 2011. ISBN 978-0-8047-7566-3. ^ Adam Smith. Fsmitha.com. [2010-06-02]. ^ 社会党国际-法兰克福宣言:"1. Socialism seeks to replace capitalism by a system in which the public interest takes precedence over the interest of private profit. The immediate economic aims of Socialist policy are full employment, higher production, a rising standard of life, social security and a fair distribution of incomes and property." ^ 社会党国际-法兰克福宣言:"5. Socialist planning does not presuppose public ownership of all the means of production. It is compatible with the existence of private ownership in important fields, for instance in agriculture, handicraft, retail trade and small and middle-sized industries. The state must prevent private owners from abusing their powers. It can and should assist them to contribute towards increased production and well-being within the framework of a planned economy." ^ 社会党国际-法兰克福宣言:"5.Democracy requires the right of more than one party to exist and the right of opposition. But democracy has the right and duty to protect itself against those who exploit its opportunities only in order to destroy it. The defence of political democracy is a vital interest of the people. Its preservation is a condition of realising economic and social democracy." ^ 社会党国际-法兰克福宣言:"2.Without freedom there can be no Socialism. Socialism can be achieved only through democracy. Democracy can be fully realised only through Socialism." ^ 丁学雷. 革命委员会就是好──驳斥苏修叛徒集团对革命委员会的无耻诽谤. 中国文化大革命文库 The Chinese Cultural Revolution Database. 《人民日报》. 1968年5月16日. ^ 《人民日报》编辑部. 痛击苏修混蛋们的疯狂挑衅！. 中国文化大革命文库 The Chinese Cultural Revolution Database. 《人民日报》. 1967年1月27日. ^ On Milton Friedman, MGR & Annaism. Sangam.org. [30 October 2011]. ^ Economic calculation in the Socialist Commonwealth (PDF). 路德維希·馮·米塞斯研究所. 1990 [2016-03-25]. ^ F. A. Hayek, (1935), "The Nature and History of the Problem" and "The Present State of the Debate," om in 弗里德里希·哈耶克, ed. Collectivist Economic Planning, pp. 1–40, 201–43. ^ Heilbroner, Robert. Socialism. (编) David R. Henderson (ed.). Concise Encyclopedia of Economics 2nd. Indianapolis: Library of Economics and Liberty. 2008. ISBN 978-0865976658. OCLC 237794267. ^ Stiglitz, Joseph. Whither Socialism?. The MIT Press. January 1996. ISBN 978-0262691826. .